5 - 4,5................Bingo von Ellendonk. 01/06/1996: 99-82-87 = 268 points. Körklasse 2 B at two years of age. Overall Build: Powerful heavy; thick short fur; good colour and markings; strong head; feminine; some teeth half-way worn; eyes slightly low-lying and medium-brown; back long and firm; good croup; good angulation; balanced gaiting; back sufficiently firm in movement; firm ligaments and good joints. Ohra von der Weyermühle passed the Erstkörung with high ratings for working drives and rated V in conformation shows. Her sire, Hertog Conan van Manensheide, was the winner of the D.V. Meisterschaft in 1993 plus winner of numerous show titles and passed the Körung 'for life' with highest rating for hardness and working drives. Her dam, Hera von der Weyermühle, competed at the D.V. Meisterschaft in 1993 and also passed the ZTP with 1A rating for character. Ohra lived to 7 years of age while her sire lived to 7 years of age with the cause of death being Bloat and her dam lived to 9½ years of age. Apollo: SchH 1 and passed the Körung with Körklasse 2B rating. 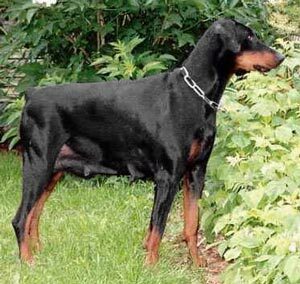 He is sire of the von der Drachenburg “A” litter (Aissil, Amica); v. Eschenbruch “F,G” litters and vom Burghof “C” litter (Comet).